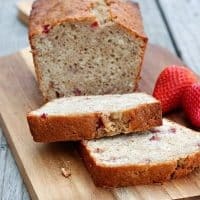 Honestly, I’d never heard of Strawberry Bread until my sister in-law shared this recipe on Facebook. It sounded so good, I had to try it that day! I replaced one cup of the oil with applesauce, and it still turned out moist and delicious. 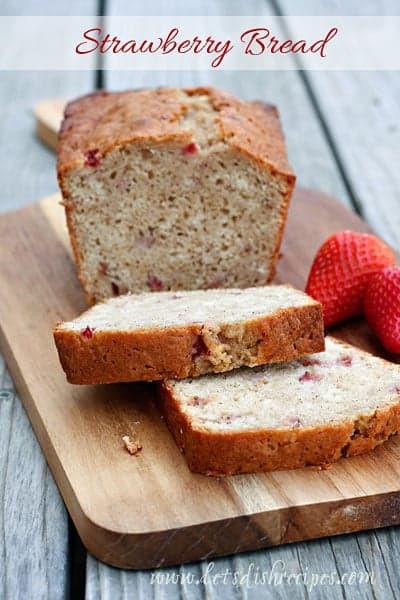 It’s a great way to use up older strawberries . . . you know, the ones you hate to throw out, but don’t really want to eat. I’m sure it would make great muffins too. In a large mixing bowl, beat the 3 eggs until thick and lemon colored. In a separate bowl, mash the strawberries. Add the sugar, mashed strawberries, and oil to the eggs and mix well. In another large bowl, sift together the flour, cinnamon, baking powder, soda, and salt. Add the dry ingredients to the berry mixture and mix until just incorporated. Divide batter evenly between 2 well-greased 9 x 5 loaf pans. Bake for 50 minutes. Cool for 10-15 minutes before removing bread from pans. This looks delicious, wish I had seen this before throwing away my almost bad strawberries this morning! (I was heading home for a few days and didn’t want to leave them in my apt. to rot)…next time I’ll definitely just use them to whip up a loaf of this bread! Just took this to playgroup and it was a hit. I only used 1.5 cups sugar, substituted 1 cup applesauce for oil(like you) and next time I will mash the strawberries really well so I don’t have any chunks of strawberry. Oh, and I LOVE the cinnamon in it. YUM! I would add more strawberries next time. I also added in a bit of vanilla to the mix and added more cinnamon as well. 3 cups of Strawberries, blended in our Ninja. Added extra baking soda – the muffins and bread loaf were a little dense and needed to rise a little further. Taste is amazing!